Peter Armitage played the role of Bill Webster on British soap 'Coronation Street' that has been on air since 1960. Actor Peter Armitage, who played the role of Bill Webster on the ITV soap 'Coronation Street' died on Tuesday at the age of 78. Armitage had successfully beaten bowel cancer four years ago and the cause of his death is currently unknown. His co-star and friend Charlie Lawson who plays Jim McDonald on the show shared the news of his passing on Twitter in a touching message, “It’s with great sadness, that I’ve to tell you my great old friend Pete Armitage has died. RIP mate," he wrote. Peter played Bill on the show in 1984 (for six months), then from 1995 to 1997 and more recently from 2006 to 2011. He had previously appeared as a different character playing a painter and decorator in two episodes in 1977. In 2014, Peter was ready to return to the show after beating bowel cancer. He revealed, "I’ve put my life on hold for the past few months, but as soon as the ileostomy is reversed – hopefully, next month – I’d like to get back to work again. It’s 30 years since I first started on the cobbles and I’ve always come in and out. I'd like to go back again, too, if there's a storyline for me." The star was divorced and is survived by his two children. His other co-stars also paid their tributes to the actor on Twitter. 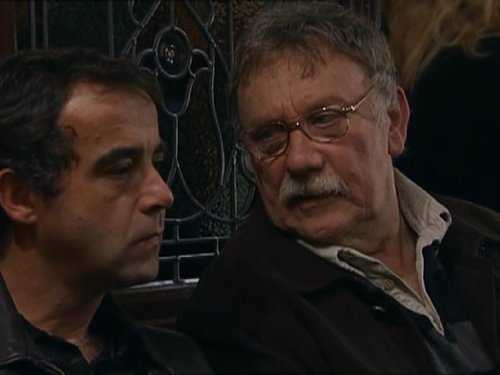 Simon Gregson, who stars as Steve McDonald, wrote, "I loved Pete what a lovely man very sad RIP lovely man." Jane Danson, who plays Leanne Battersby, added: 'So sorry to hear this, lovely man. Thoughts to family and friends." Samia Longchambon, who stars as Maria Connor, wrote: 'So sorry to hear this Charlie. Pete was such a lovely man.. he’ll be sadly missed." The actor's other TV credits include 'The Befrienders', 'Couples', 'Jack the Ripper' and 'Hearts and Minds', as well as 'Lucky Feller', a short-lived sitcom starring David Jason. In the early 1980s, Armitage appeared in a well known Yellow Pages commercial which brought him to the attention of Granada Television and an audition as Bill. Before acting, Armitage worked as an engineering apprentice, served in the Merchant Navy and from 1964 onwards worked on digging the London Underground Victoria Line. It was during this last job that his interest in acting kick-started after he befriended an amateur plays producer, leading him to enroll in a Loughton, Essex drama school, reports Daily Mail. 'Coronation Street' also known as 'Corrie' is a British soap opera created by Granada Television and has been shown on ITV since December 9, 1960. The programme centers on Coronation Street in Weatherfield, a fictional town based on inner-city Salford. In the show's fictional history, the street was built in 1902 and named in honor of the coronation of King Edward VII.